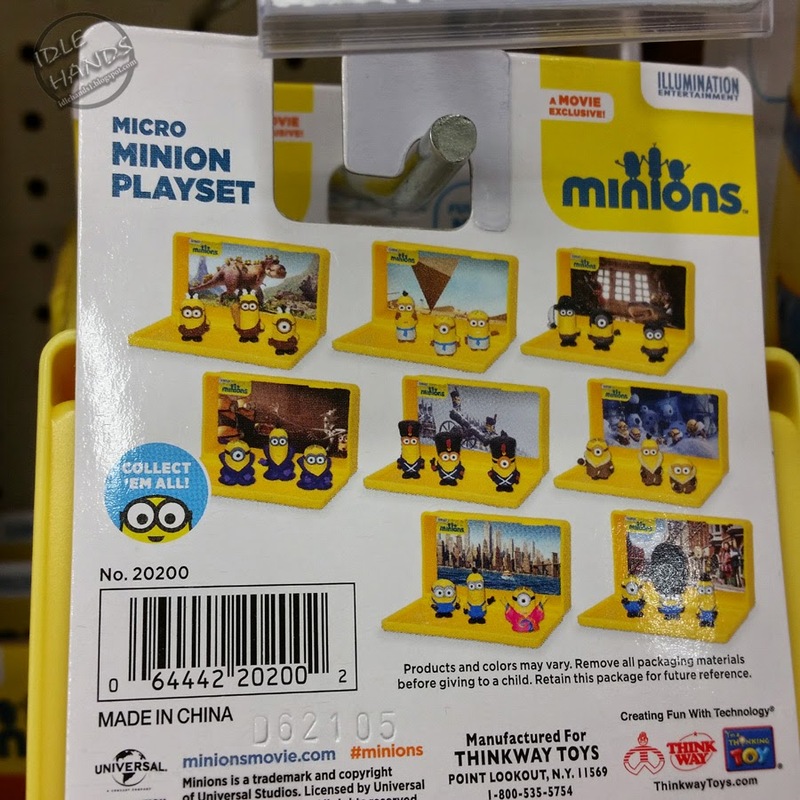 ThinkWay Toys seems to be the primary licensor, though Hasbro and Funko also have a small slice of the action. 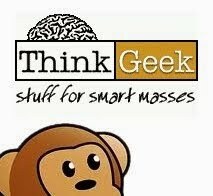 For today, we'll stick to ThinkWay, as their products have been awesomely fun...and dominate the isles these days. 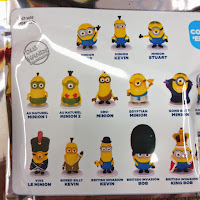 Mini Figures: Blind Packages figures give the collector a chance at 1 of 15 different Minions including Bob, Kevin, Stewart, Au Naturel Minion 1 and 2, Cro-Minion, Egyptian Minion, Gone Batty Minion, Eye, Matie Minion, Vive Le Minion, Bored Silly Kevin, British Invasion Kevin, British Invasion Bob, British Invasion King Bob and Peace, Brother Minion. 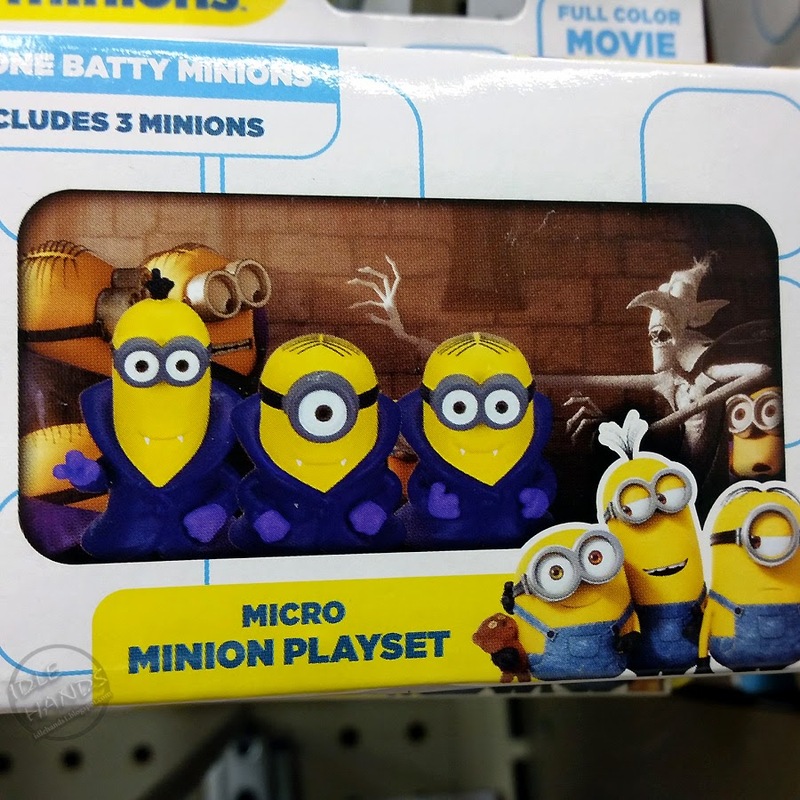 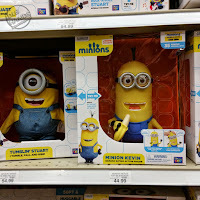 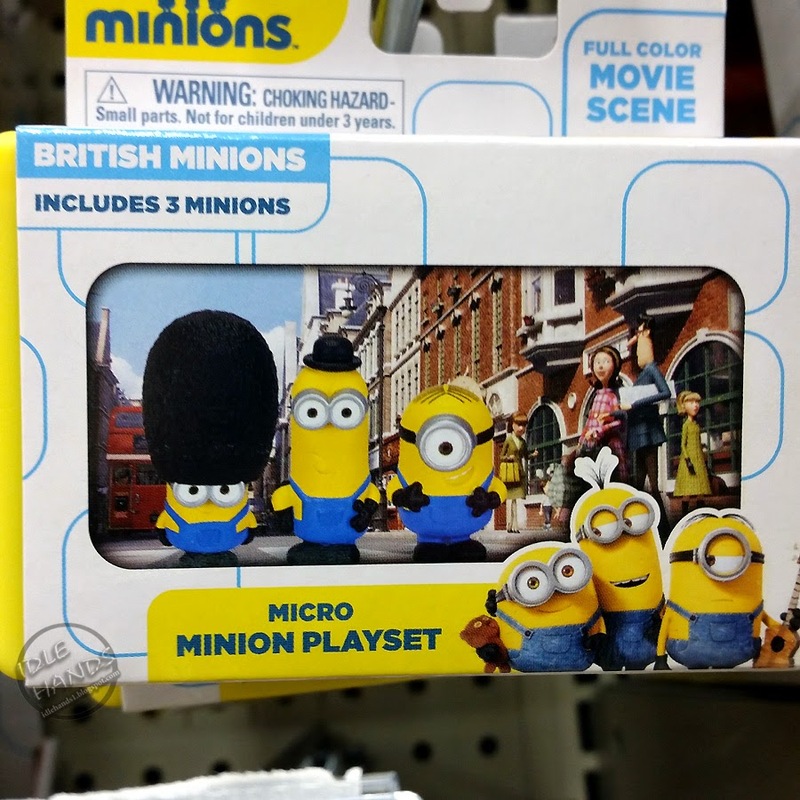 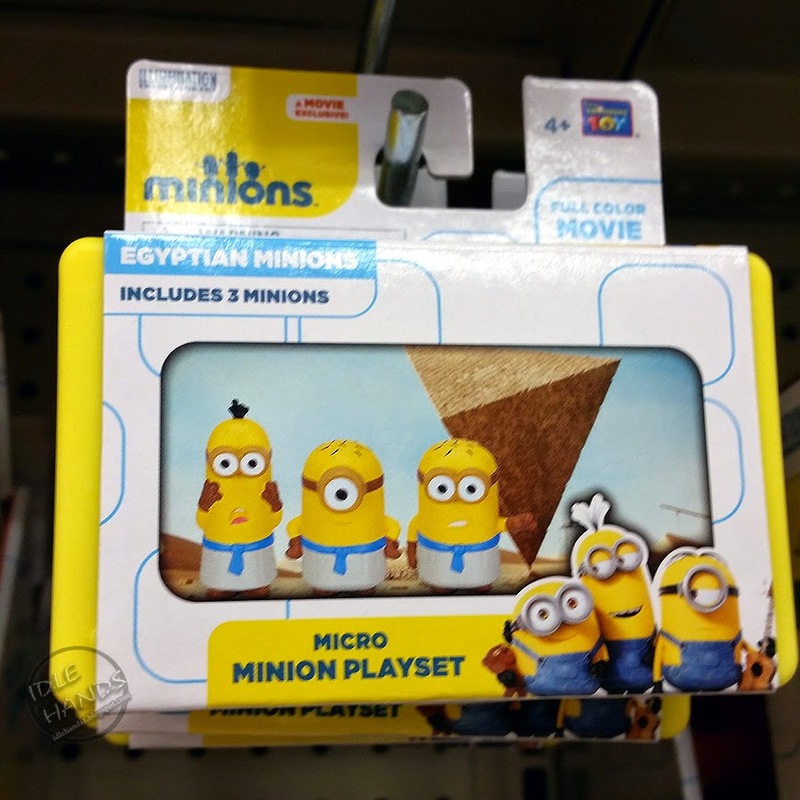 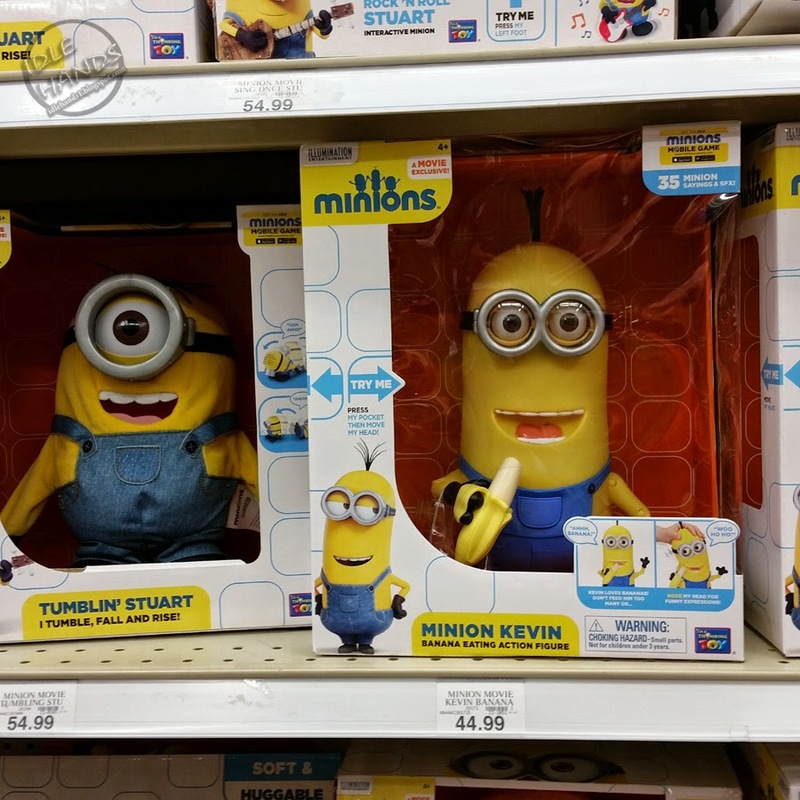 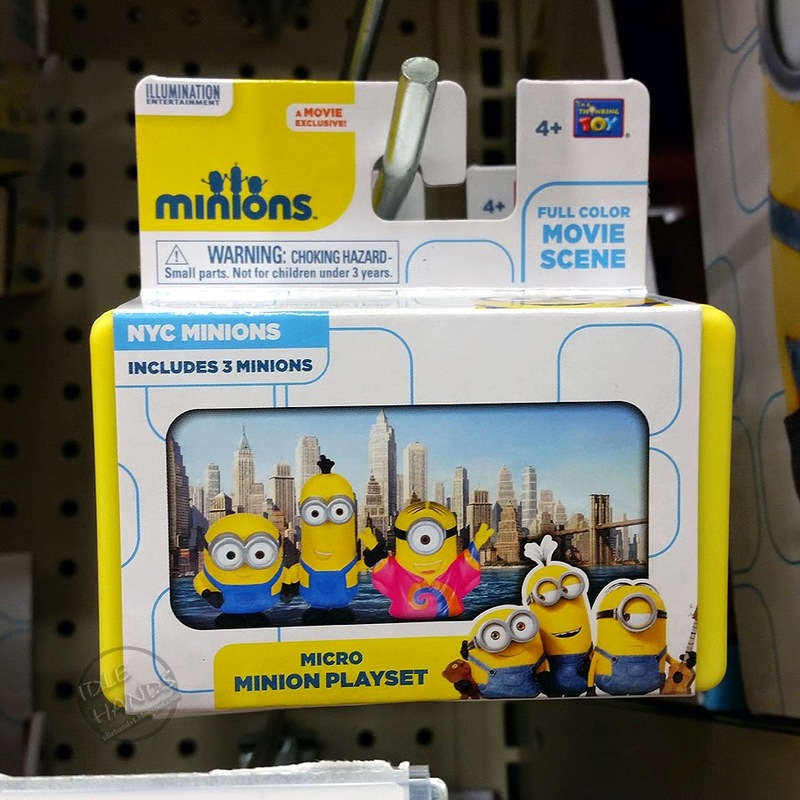 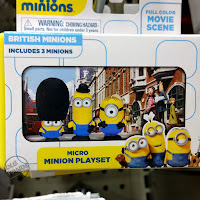 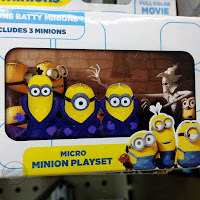 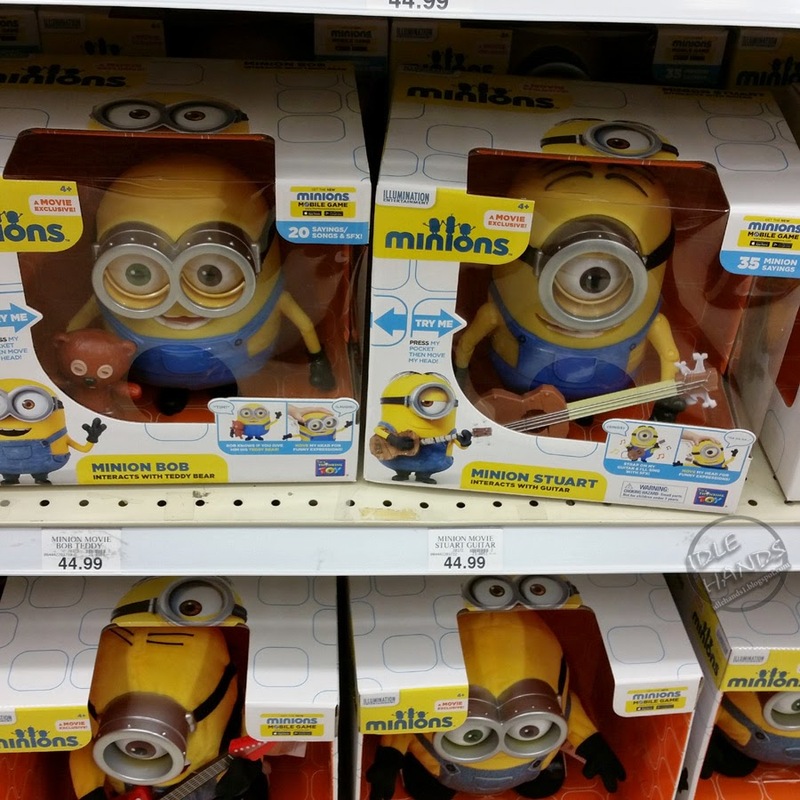 Micro Minion Playsets give you three Minions and a little backdrop. 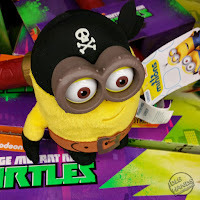 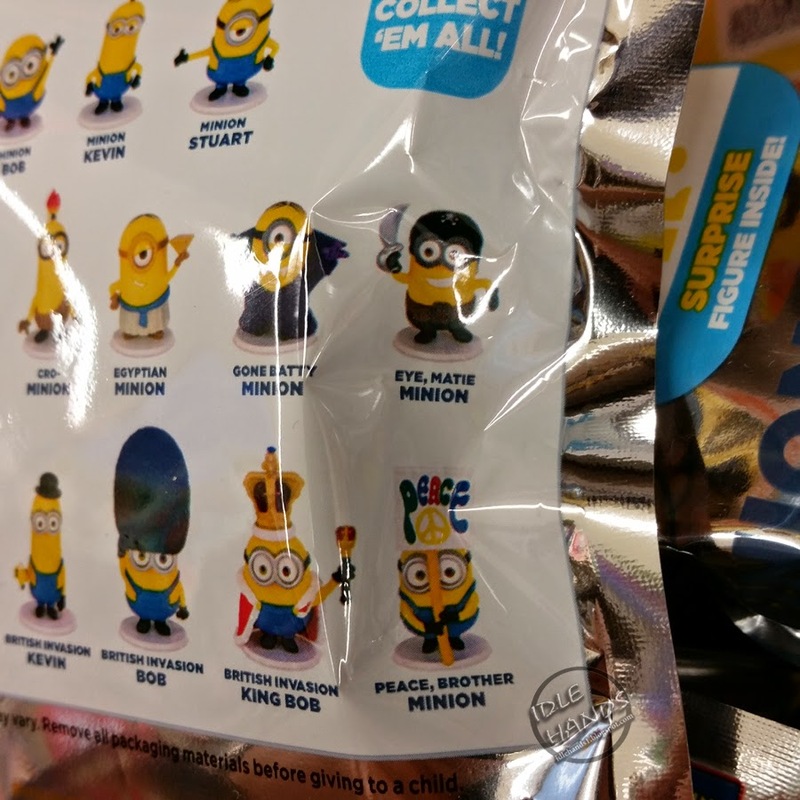 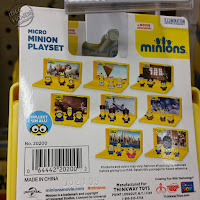 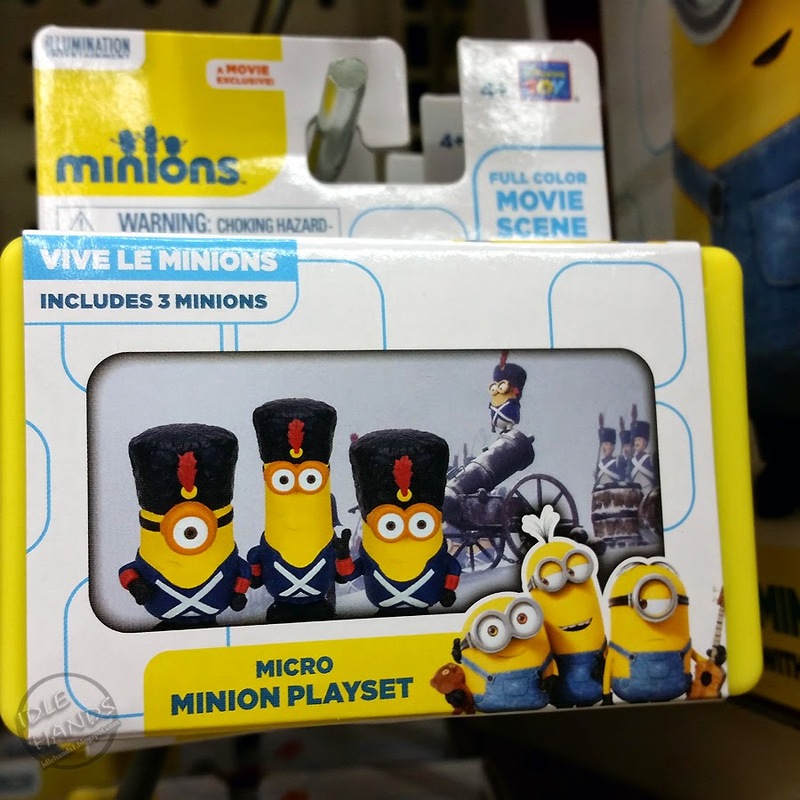 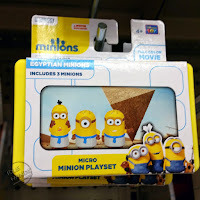 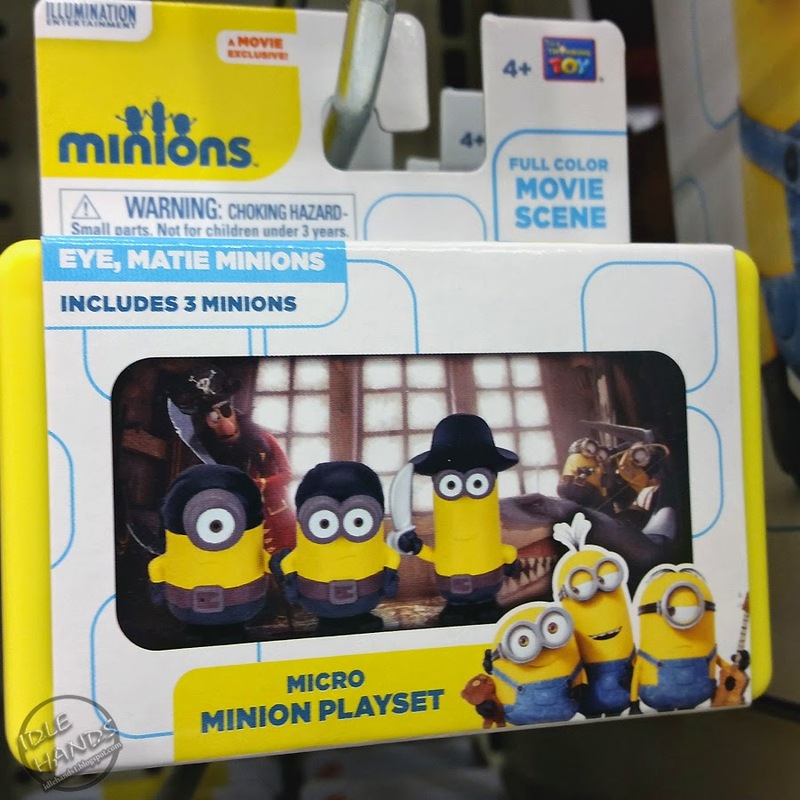 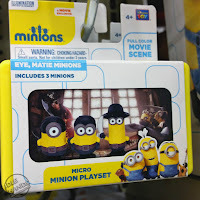 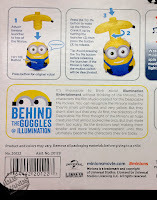 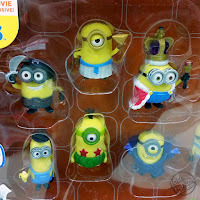 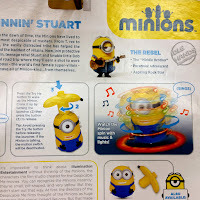 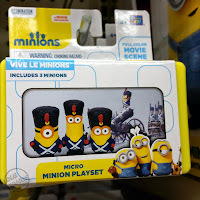 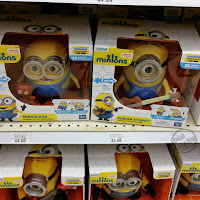 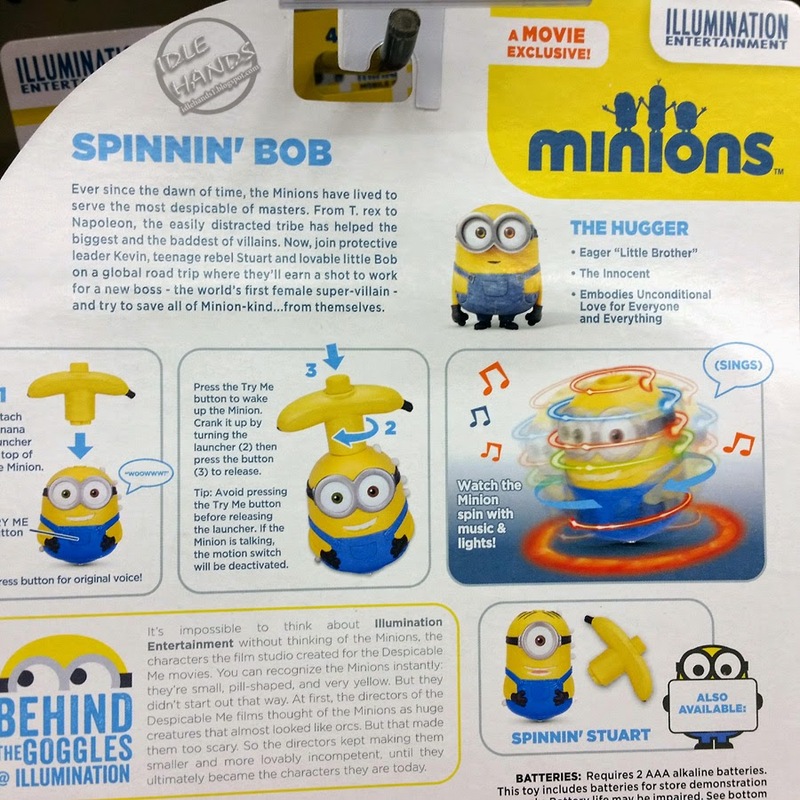 Sets include Vive Le Minions (French), Eye, Matie Minions (Pirates), Gone Batty Minions (Vampires), British Minions, Bored Silly Minions (cold weather gear), Egyptian Minions, NYC Minions and Cro-Minions (caveman minions). 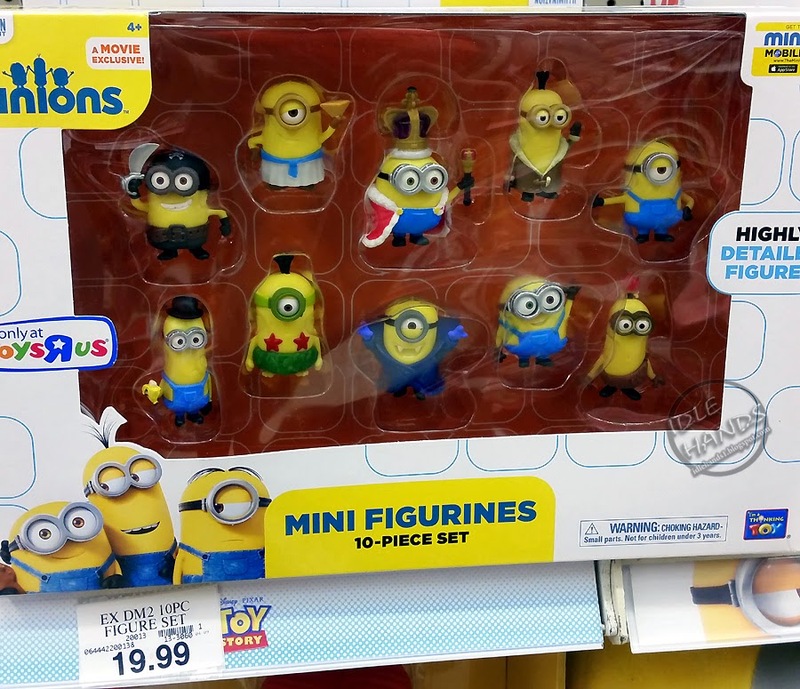 There's also a 10 figure Toys R Us Exclusive pack with a little bit of everything included. 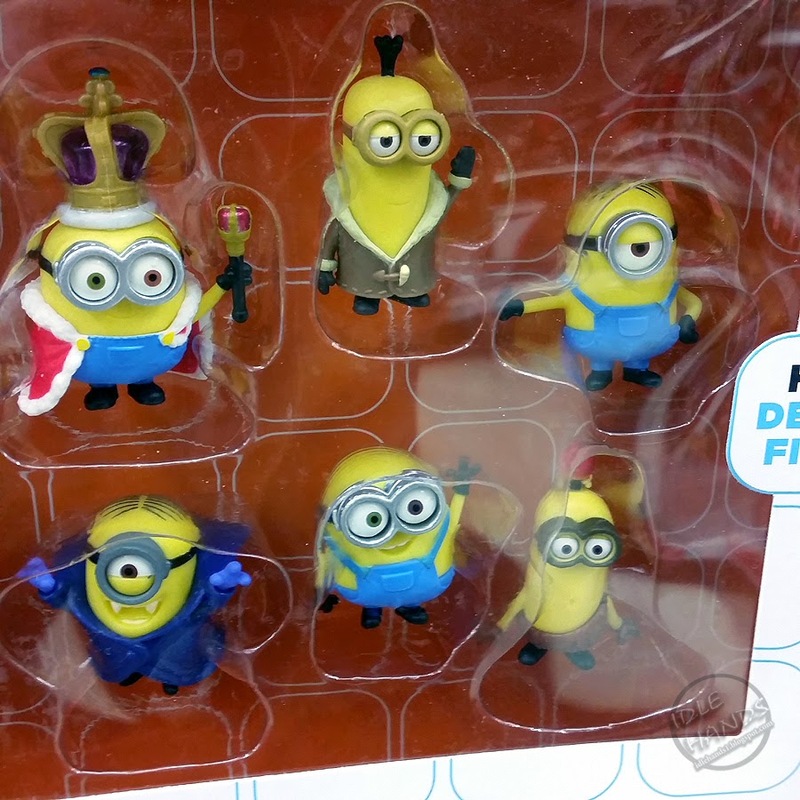 Yep...the star fish bra and hula skirt wearing Minion is in there. PLUSH! 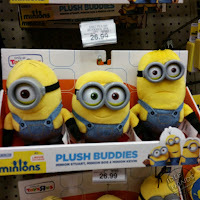 : They may not be fluffy, but they look super squishy. 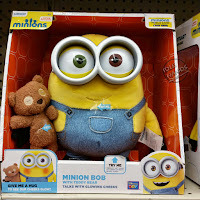 The big boy at the bottom features light up rosey cheeks and sound effects when you give him a squeeze. 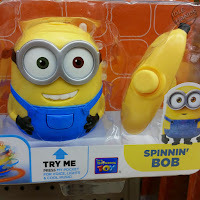 Mid-Size Figures: First we've got Spinnin Bob and Stuart, who aren't exactly figures, but they seem waaaaay more fun than that! 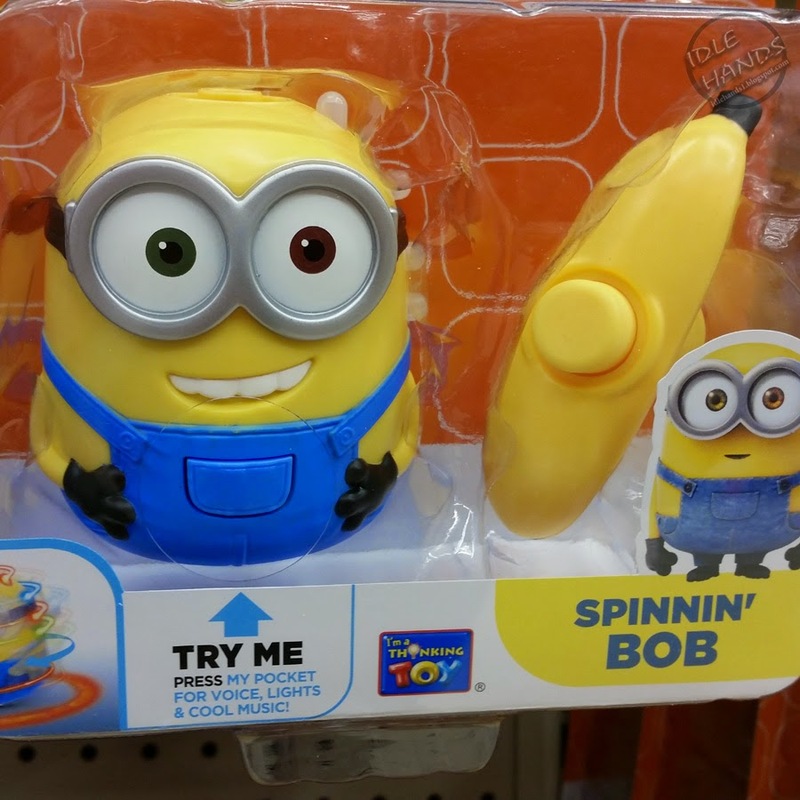 Plug the banana into their heads and crank them up, hit the button and off they spin with lights, sounds and music accompanying their trip. This would keep me amused for a half hour....45 mins tops. 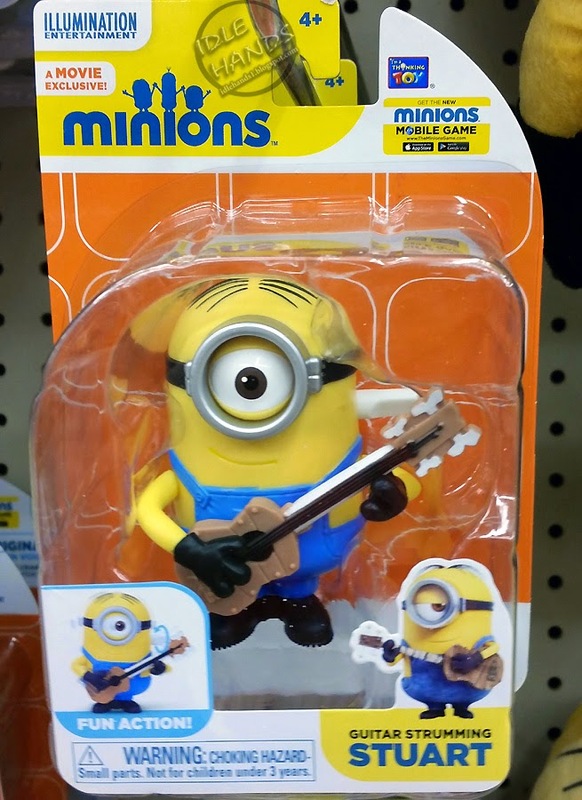 That's like...forever. 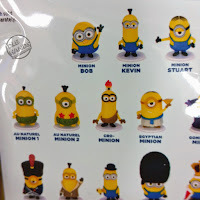 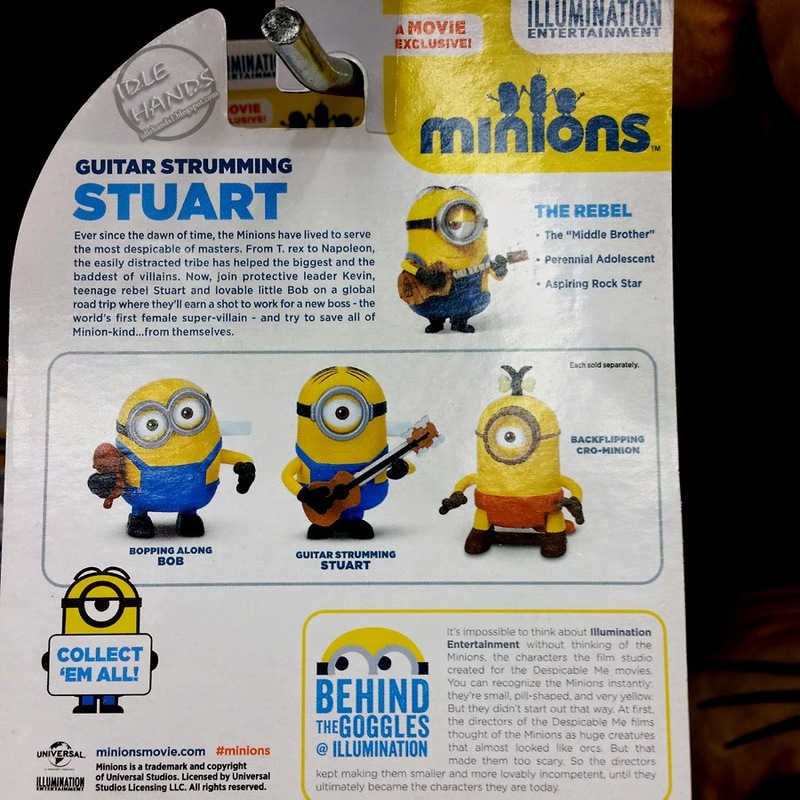 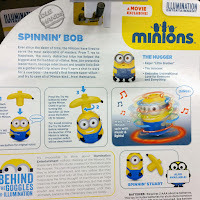 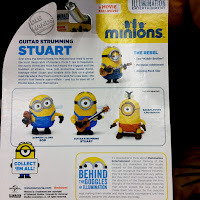 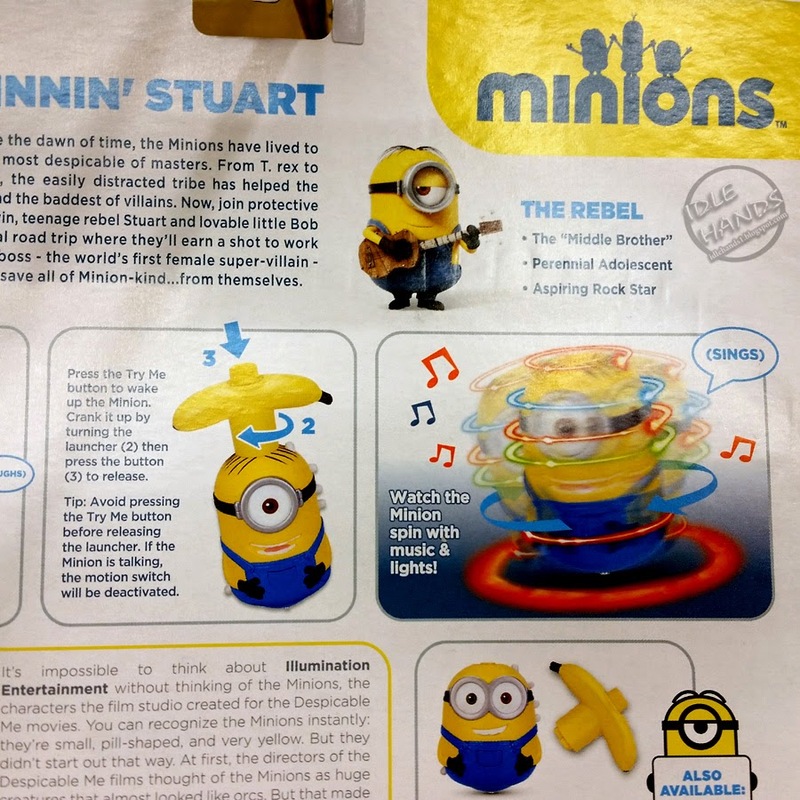 The next bits are also not technically figures, but rather wind-ups including Bopping Along Bob, Guitar Strumming Stuart and Backflipping Cro-Minion. 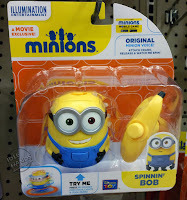 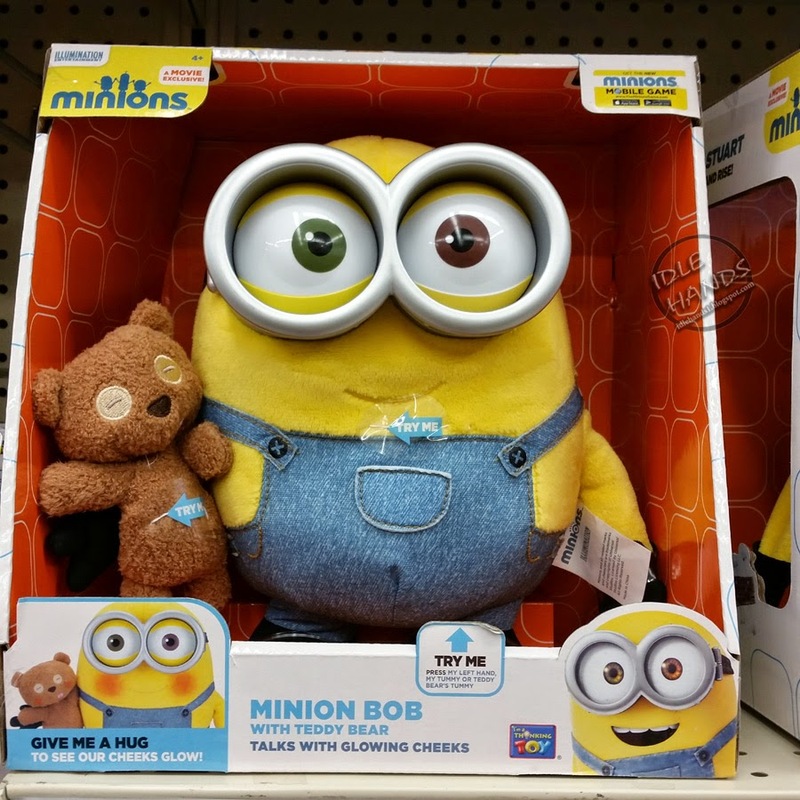 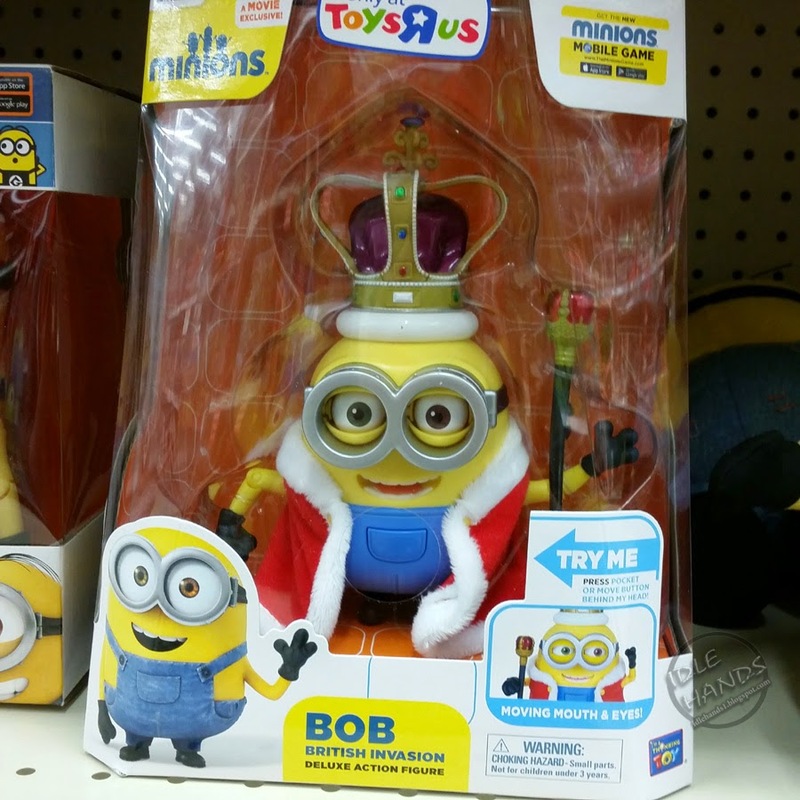 There's also a Toys R Us Exclusive British Invasion King Bob with ultra creepy blinky eyes and a moving mouth. 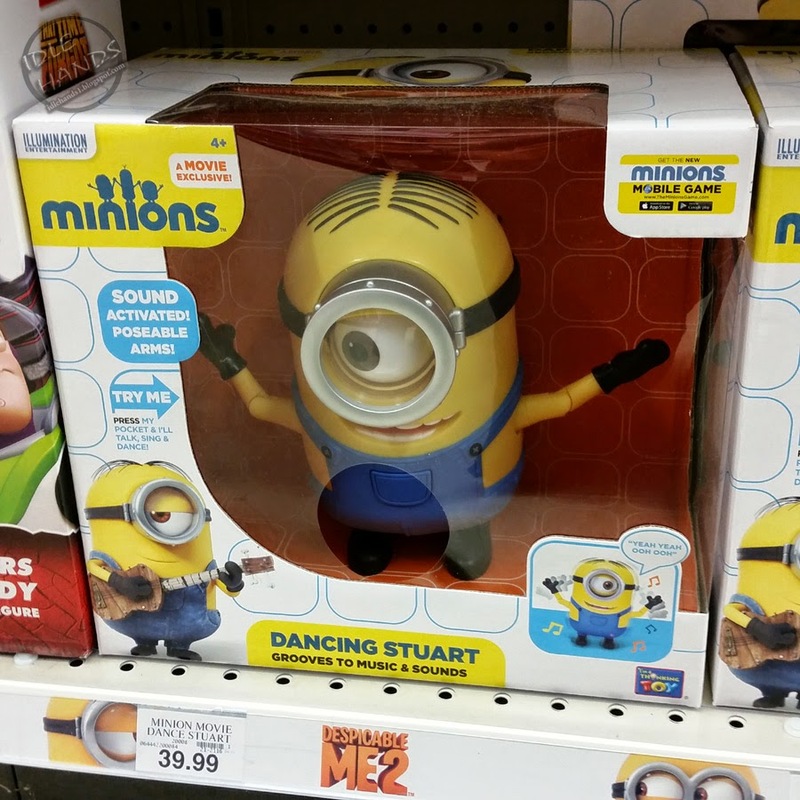 ~shudder~ THAT ONE is actually labeled a deluxe action figure. 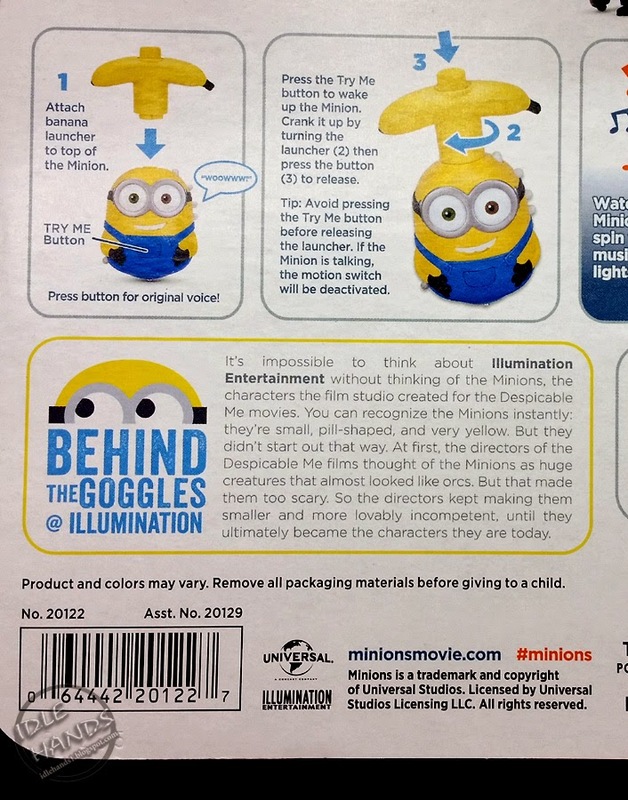 Lil Anamatronic Dodads: The first movie there was...what..zero? 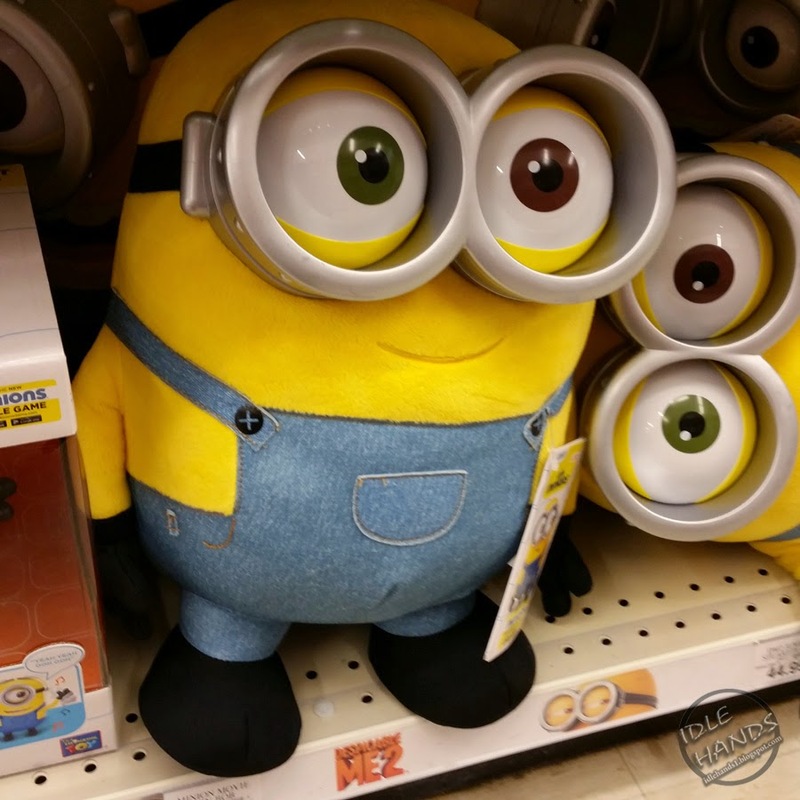 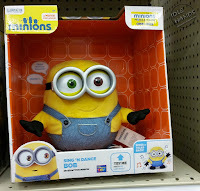 After people went berserk, maybe 1 giggling Minion popped up. 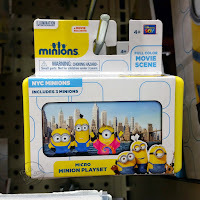 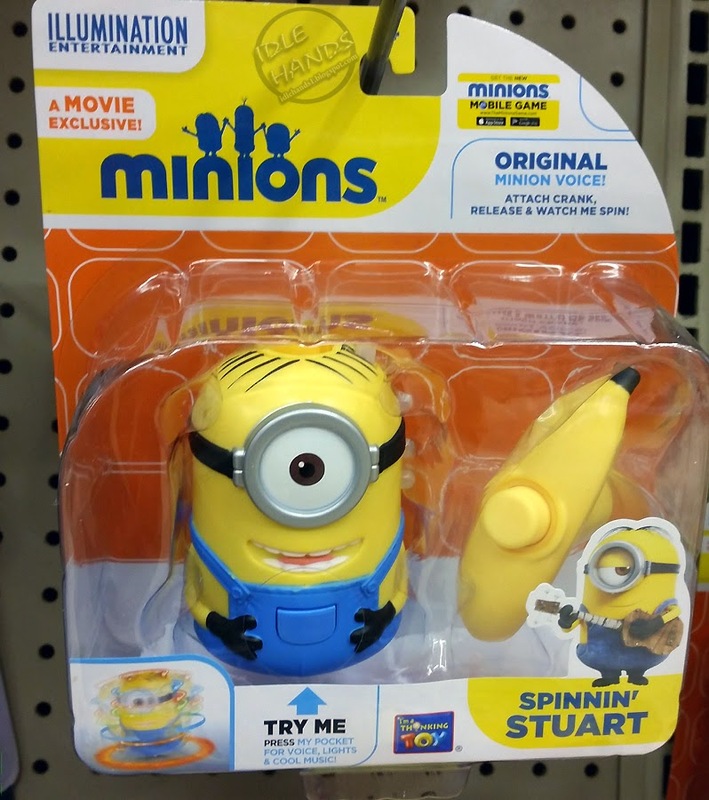 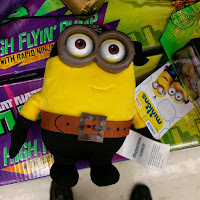 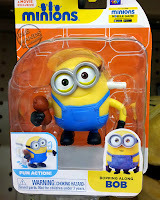 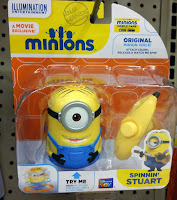 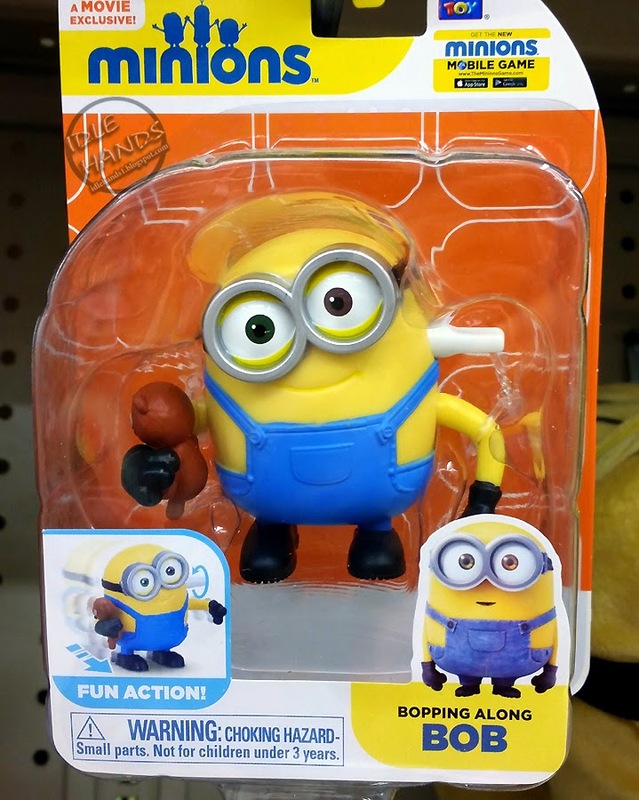 The second movie had the fire truck Minion and one with the odd action feature that asked you to stick your finger in its mouth so he could claim it's a banana and make chewy noises. 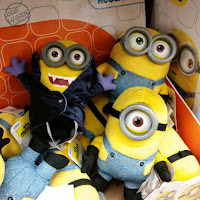 I'm sure there were at least two others along side that freaky yellow baby. 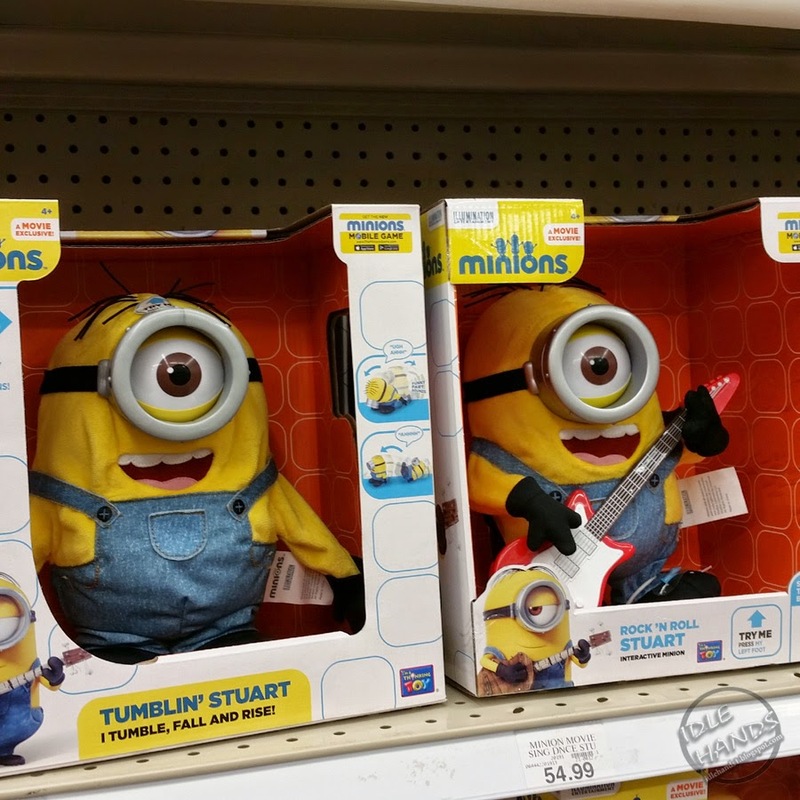 This time around....they are LEGION. 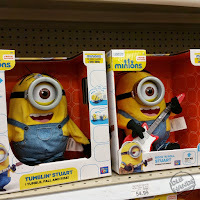 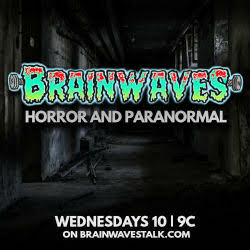 They play guitar, pal around with a teddy, waggle their Kermit-like filanges and TWO suggest you shake them around by their sizable craniums to activate more sounds and phrases. WHY MUST THEY INCLUDE SHAKE THE BABY ACTION!!??!! Insane. Minions...love em...hate em...want to run an ap on you brain so you don't have to hear their helium enhanced voices anymore? 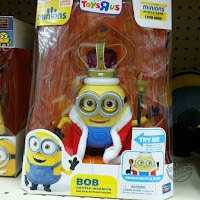 Voice your opinion in the comments!